The New Normal: In an era of budget cuts, CIOs must reset expectations of what IT can handle — and rebrand IT as an efficiency expert. 3D, or Not to Be? Smartphones: Teaching Tool or Brain Candy? CT Innovators: Where Are They Now? Women in IT: Why does IT remain a male-dominated ﬁeld, and how can more women ﬁnd success in it? 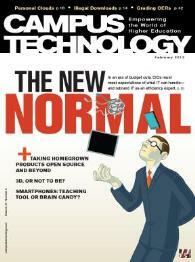 Consumer Tech Hits Home: Consumer devices are reshaping higher ed. Can centralized IT survive the impact? Will the Real Digital Native Please Stand Up? Do For-Profits Do IT Better? Despite recent controversy, for-profit schools’ advanced use of technology offers valuable lessons for traditional institutions.